If you choose this sweet arrangement cheer and happiness will surely come visit your home. The mixture of smiley yellow daffodils, cerise and soft purple tulips is simply wonderful. Deluxe size bouquet pictured. Contains 25 stems. Grand size available, not pictured. I haven't ordered flowers online for quite a long time. A friend of mine recommended handy Flowers and I decided to take the risk. Best decision ever! The bouquet was one of a kind! Thank you! I would certainly use this florist in the future. the birthday flowers I ordered looked fantastic! I was pleasantly surprised by this bouquet - fresh tulips, vibrant daffodils, delightful fragrance.... Liked it a lot! Ordering this bouquet was as easy as 1, 2, 3... I just called and a lovely lady took my order. The bouquet was delivered the next day and my sister said it was looking amazing. Good job Handy Flowers, you certainly know how to please your customers. 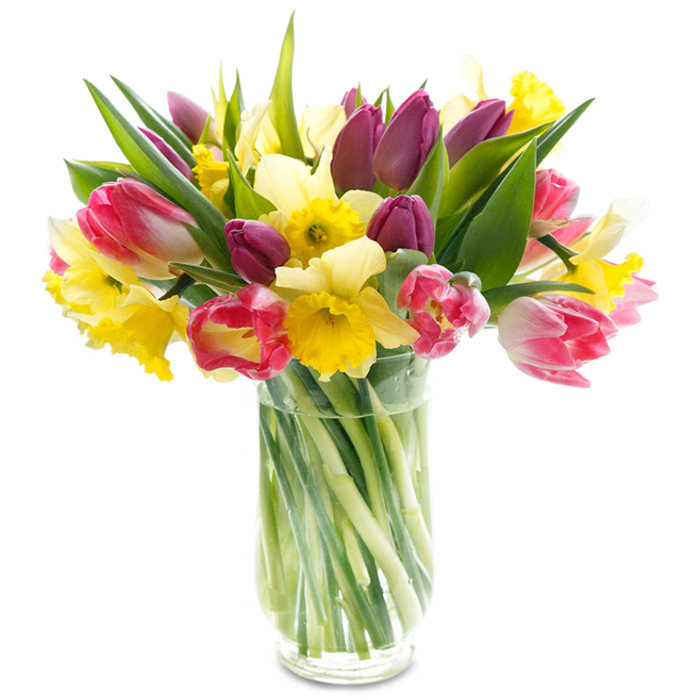 This bouquet just speaks "Spring is here!" Love it! WOW, this bouquet is AMAZING! I will definitely order flowers again soon! This company is great! Simple but yet very cheerful and beautiful bouquet! My mum loves flowers, so I like to surprise her with a nice-looking bouquet every now and then. Recently, I’ve been ordering from this online florist and my mum has noticed the difference – she said those last few bouquets were the most splendid I’d given her so far. Big thanks for the prompt delivery and lovely combinations! You’ve really helped me keep my mum happy. When I saw this bouquet, it was love at first sight! Very fresh and unique flower arrangement! Very professional flower delivery service. They only use fresh-cut flowers and have many gorgeous-looking bouquets. The choice was so overwhelming that I didn’t know which one to select at first, but found this perfect bouquet in the end. Will use Handy Flowers again! This was a surprise gift for a friend and I have to say we were both thrilled with the quality of these flowers. ave only got good things to say – everything is smoothly run and the flowers are always gorgeous. Amazing service! Arrived so quickly and the flowers looked even better in real than online, which I didn’t think was possible! Everything, from choosing the flowers to getting them delivered was so easy. Exactly how online shopping should be! Beautiful products, great service and a happy recipient – couldn’t ask for more!